And it costs just $9,000. To say the Mercedes-AMG G63 6x6 is epic would be an understatement, and its half a million dollar price tag is completely out of reach for most. As The Drive first picked up, a group of Japanese students at the Nihon Automotive Technology School needed to come up with a project and, after some brainstorming, decided to convert a Suzuki Jimny into 6x6 replica. With a budget of just 1 million yen, roughly $8,800, they made it possible. The result is a startling replica of one of the greatest and most opulent off-roaders of all time. 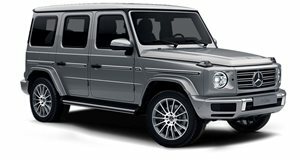 At first glance, yeah, it totally looks like a genuine G63 6x6. The most evident giveaway that it’s not Mercedes-built is its size. Anyone who’s seen a Jimny knows how small they are, but the students required two of them to serve as donors. Lots of chopping was involved, specifically the rear end and increasing the frame’s length in order to accommodate an extra axle. The bed is entirely custom, and it includes an airbrush paint job that imitates the real wood finish in the real deal. However, the grille, LEDs, taillights and bumper are all real Mercedes parts. The result is a mini G63 6x6 that can easily fit in Japan’s often narrow streets.